I come from a very unique, beautiful place. This is something I have only come to realize in the last couple years. When I was younger, I couldn't wait to leave the Big Island. But now, I am counting down the days until my return. I think this realization is something I had to grow in to. I had to travel, see other places and return home to realize that I live in a paradise people desperately search for. It is a gem. And then there is Brandan Ahuna. We only recently became real friends. I always [sort of] knew of him. Growing up, I was afraid of him. He was the dark, Hawaiian lifeguard who never smiled. At me anyway. And really good at surfing. My man once told me that Brandan gave him "permission" to surf a secluded surf break after he shot some video [that turned out alright I guess.] I thought, 'Oh man. He's one of those guys. I get it'. And didn't put much more thought into it. I guess you could call me ignorant for making those kinds of presumptions. After spending quite a bit of time with him on my last trip I realize he is a gem [along with other Big Island peeps.] He is a lot more complex than your average local boy. He likes vintage cars and mid-century furniture. He listens to NPR and buys The Honest Co. products for his daughters. And he has been working a lot with wood lately. If you don't already know, the board you see him riding isn't your average surfboard. It is a finless, thin piece of wood modeled after traditional surfboards of ancient Kānaka Maoli. And probably one of the hardest ways to ride a wave. But that guy makes it look so easy. Brandan is probably one of the best Alaia riders I have ever seen. I am not just saying that. He catches just about every wave he paddles for and maintains amazing style throughout the ride. And you know what else? He shapes his Alaia just as good as he rides them. Yep. He shapes them himself. As if you need a reason to like him even more. I'm currently waiting for my own order, actually. 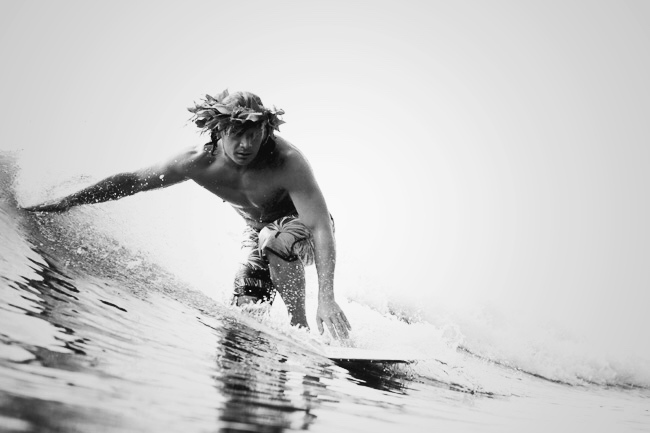 And sort of hoping I will surf just as good as him. Maybe is mana [or power/skill] will rub off on me. Haha.. wishful thinking. Either way, really looking forward to my custom Ahuna x Ladyslider board and so stoked be friends with gems like Brandan [who are doing amazing things and not even asking for attention.] Sometimes super humble, talented guys need a little shout out. Holler if you're interested in getting a custom Alaia too! I'll pass on his info! Alaia by Ahuna, Good on Wood.